Miami Shores, “the village beautiful” is an older, family oriented, suburb of Miami. Located in northeast Dade, between I95 and Biscayne Bay, this area is ideal to raise a family, work, and enjoy the convenience of good schools, a variety of sports, and a large selection of clubs, churches, and organizations to belong to. Comprised mainly of single family homes, Miami Shores is known as one of the safest communities in Miami with a local government very responsive to the needs and concerns of its residents. Move-in ready. Gem on quiet street, close to Bay and park. East of Biscayne - easy access to everywhere. Priced for your upgrades not someone else's!! Spacious, light spilling in from glass sliding doors along one side of the house. Perfect for small family, retired couple or 2 single people - 2 large bedrooms - 3 full baths. Beautiful screened in freeform pool - screened patio for evening entertainment. Garage attached with huge storage. Buyers will love the signature details from famed architect of mid century moderne! Close to good schools and colleges. Sellers offering $2,500 credit at closing towards new carpeting/tile in bedrooms.Easy to show - very motivated sellers - available through listing agent - call or text LA. 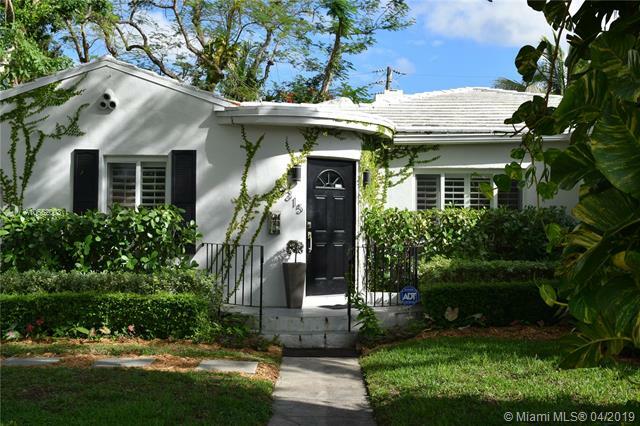 Welcome all discerning buyers to this Beautiful 1942 vintage Miami Shores opportunity. This gem boasts a white wood beamed cathedral ceiling centered with an elegant Schonbek Chandelier and wood burning fireplace on a private fenced in corner lot with pool and specimen landscaping. The lush garden includes native butterfly plants, palm trees, orchids and new tile decking. Features also include original vintage clay floors in living and dining room, oak wood floors in hallways and bedrooms, den/office, new granite kitchen with stainless steel appliances, adjoining laundry room with brand new Samsung washer and dryer...Miami Shores is one of the top rated Miami suburbs with its own police force, country club, restaurants, movie theater, and 5 A+ rated schools. Furniture available. Miami Shores Charmer! This Adorable home is screaming with charm inside and out. Featuring beautiful hardwood floors throughout which were just varnished, a living room with a wood fireplace and vaulted ceilings, French doors off of kitchen and family room and a truly magical back yard with built in barbecue on a patio deck surrounded by tropical foliage. There is a tastefully renovated kitchen filled with natural light adjacent to both formal dining and a perfect office, breakfast area or den. Plenty of room for a pool and parking in front or rear. Lots of closets and storage shed in rear of property. Additionally features a large family room or third bedroom. A must see! One of Miami Shores best values!Beautiful Classic Charmer! ..w/original fireplace w/carved masonry mantel.Custom architectural moldings.Gleaming wood flrs,professionally polished.Vaulted beamed ceilings in spacious Florida Room leads to EXTRA-LARGE oversized deck -GREAT for entertaining!Lots of space to play in the huge fenced backyard.Kitchen is light,bright & white, & complements the original features throughout the home.Roof is in good condition,NEWER A/C,UPDATED electric to current codes,NEW plumbing throughout entire house!NEW septic tank located in front of the house,room for a pool in the backyard.Windows are hurricane IMPACT & energy efficient.Gar.converted to a 'bonus rm' could be artists studio/den(not finished space),FRESH paint inside throughout! Classic 1940s Monterey model 2-story. Lovingly cared for and renovated to maintain original character, this home is charming, spacious, yet with a definite privacy and full of natural light. Separate formal living with wood burning fireplace, original pegged hardwood floors and 9 foot ceilings, large family room with French doors to pool area, formal dining, updated kitchen, office with full bath and a 2nd family room/play room. Upstairs offers 2 bedrooms that share a bath, plus master suite, includes beautiful bath and French doors to large private Lanai. Approx 12k corner lot offers loads of space for entertaining and privacy and tons of storage space. First time on the market in years, prime location, do not miss!! Miami Shores, THIS IS A PIECE OF ART whit big lot 11,500 sf , Historic 1926 Mediterranean sanctuary nestled amongst an inviting mix of lush tropical landscaping & sun-kissed outdoor splendor spread throughout a double lot. An eye-catching entrance invokes a homey feel w/ 1920's detailing including wood floors, a vintage kitchen original fireplace, & sunroom/office. Master suite w/ newly remodeled master bathroom & updated closets. 2 large bedrooms upstairs w/ large full bath, new a/c & new water heater. 2 car garage w/ charging station for electric car. COMPLETELY REMODELED GEM WITH DECK, GARDEN AND LAP POOL! CAN EASILY BE CONVERTED TO 4/3. Split floor plan with 2 bedrooms and 2 bathrooms, Large living room with working fire place, sitting area, dining area overlooking deck and oversized lap pool, open kitchen with kitchen Island, studio/den with room for third bathroom (existing plumbing) and former garage which can be converted to 4th bedroom. Vaulted ceilings, hardwood and tile floors, new roof, new plumbing, new electrical. Mint condition with high end Italian style finishes. Furniture can be sold separately. Quiet side street in great location in the best part of Miami Shores with shops, Fedex, Starbucks and parks just one block away! Easy access to I-95. This gem won't last - call La today! REDUCED & READY TO GO! Looking for Mr. or Mrs. Right! Investors-developers, build your dream home on one of Central Miami Shores' largest most prestigious corner lots (~14,000 SF), and rescue this home! Unleash your creativity and transform this spacious blank canvas with ~4,000 SF of living plus pool and lush gardens into the iconic dream home that it deserves to be. Nestled away on a closed-access quiet tree-lined street away from the flood zone. You may have seen it listed before, yet rest assured, the new owner has cleared all previous municipal liens and violations so you won't waste time on such matters. Instead, focus your energy on creating a masterpiece estate that lives up to the highest standard of all: yours. With the right input, the rewards can be endless. Miami Shores Stunning 3 Bedroom 3 Bathroom 2,600sqft. Master bedroom entails a large walk-in closet - Stand alone tub - His&Hers New Cabinetry - Mosaic Tile Standing shower with waterfall shower head and linear drain- Second bedroom has its own full bath and built closet. The Kitchen is fully custom with Samsung Fridge/Built in Microwave & Oven. Limestone has been placed with in the Kitchen and Family Entertainment area. NOT YOUR COMMON MIAMI SHORES HOME. AMAZING OPPORTUNITY. Main house with 3 bedrooms and 2 bathrooms + GUEST COTTAGE with 2 bedrooms and 1/1 bathrooms and 1,008 sq ft of living space. The house has a wood burning fireplace for the winter mood, Florida room that you can use as your spacious and bright office, the carport for one car with attic and additional storage space. At the driveway you can easily fit 3 cars. Two-storied guest cottage has both separate and common entrance with separate electric meter and additional space for the car. Miami Shores community offers a recreational center, aquatic park, golf and tennis courts and easy access to the beaches & airport. HUGE PRICE REDUCTION! Beautifully renovated split floor-plan home in the heart of Miami Shores. All new high-impact windows & doors, new kitchen, new bathrooms, new flooring throughout, new light fixtures, and a double oven. Master bedroom has walk-in closet. Attached 1 car garage as well as a back patio with pavers and room for a swimming pool. Easy flow through home with plenty of natural light. Wonderful family home on a quiet street. Miami Shores....3 bedrooms and 2.5 baths on quiet corner lot. Huge fenced yard with patio and room for a pool. Nice landscaping with fruit trees, very private. Entry foyer leads to a big living space with excellent natural light. New Italian porcelain tile throughout entire house. Dining room is open to the kitchen. Updated kitchen with eating bar, granite and stainless steel. Garage was converted to bedroom with 1/2 bath. Inside laundry with a/c. There is an office or 4th bedroom depending on your needs. Good sized master bedroom with walk-in closet, good storage space throughout the house. House is freshly painted. New a/c in 2016, new septic in 2016, sprinkler system and alarm system. Move in condition. 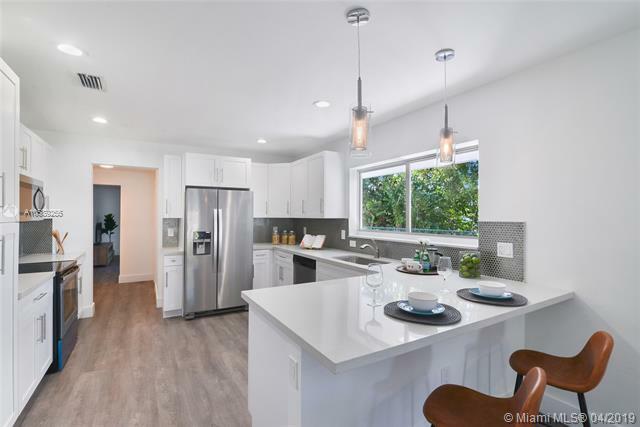 Totally renovated 3 bedroom 2 bath home in Miami Shores. Walking distance to cafs, restaurants, shops, the theater and more. Beautiful new bathrooms, brand new kitchen, all new floors. Hurricane impact windows, new air-conditioning, new electric and plumbing. Very open floor plan with a lot of natural light. Huge covered carport, storage closet, inside air-conditioned laundry room/pantry. Master bedroom has large walk-in closet and spa like bath. Side patio, great for barbecues and outdoor activities. Freshly painted inside and out. This home is in move-in condition. 3 BEDROOMS AND 2 FULL BATHS IN MIAMI SHORES. ATTACHED 2 CAR GARAGE, ROOM FOR A POOL IN THE LARGE BACKYARD. WOOD AND TILE FLOORS. UPDATED KITCHEN IS OPEN TO THE DINING ROOM. BIG LIVING ROOM AND HUGE FAMILY ROOM OVERLOOKING THE YARD. BOTH BATHS ARE UPDATED. BIG MASTER BEDROOM WITH LARGE CLOSET. GOOD BEDROOM SPLIT. WALKING DISTANCE TO THE COUNTRY CLUB, THE RECREATION CENTER AND THE POOL. HURRICANE SHUTTERS FOR ALL WINDOWS. EASY TO SHOW. Very warm and charming 3 bedroom and 2 full bath home on a quiet street in Miami Shores. Big fenced yard with room for a pool and an attached one car garage. Walk to the park, the sculpture garden, shops and cafes, Starbucks and Dunkin Donuts.Original wood floors, big living room with fireplace and cove ceiling, open to the dining room. Dining room has original corner cabinet built-ins. Big kitchen, huge Florida room overlooking the yard. Great bedroom split, both baths are original. Newer roof, Make this house your own. BEAUTIFUL HOME IN MIAMI SHORES EAST OF US 1. GREAT BACKYARD COMPLETELY PRIVATE.. BIG LOT. ROOM FOR A POOL., SQ. FT PER TAX ROLLS2 BEDROOM ...3RD CONVERTED TO A DENBRAND NEW ROOF AND AC. GARAGE IN THE BACK CAN BE TURNED INTO GUEST HOME.HOME FEATURES HARDWOOD AND MARBLE FLOORS. GREAT LIGHT WITH MANY WINDOWS THROUGHOUT . QUIET NEIGHBORHOOD. Price Reduced! Great Value for Miami Shores Gem! Charming 3 Bed/ 3 bath family home with Fireplace. Beautiful Hardwood Floors throughout. Hurricane Impact Windows. Extra large double Car Garage, Separate Additional Workroom. Easy to Show! This gorgeous single family home located in the desirable Miami Shores is centrally located within walking distance to parks, shops, restaurants and golf course. This turn key home, completely updated, features a bright and airy open floor plan and a huge private yard with enough space for a pool. Kitchen has new quartz counter tops, crisp white cabinetry and breakfast bar. Also, the 2 full baths have been updated with quartz counter tops and custom sinks. One of a kind modern architectural home in Miami Shores. Natural light flows throughout this 4 bedrooms, 3 bathrooms, 3300+ square foot home with views of the pool from every room. After a 22 month renovation, no detail was spared. Brand new roof, plumbing, windows, additions and more. The floating roof to go along with the 17' high ceilings add to the spaciousness. Take a dip in the pool next to the koi pond and 15-foot foliage for privacy on this oversized corner lot. A must see in person. Henry End was the architect. Move into this elegant 2-story home -occupying 3 lots- featuring 3 beds 2.5 baths, a florida room in the main house and a separate ensuite cabana/guest room in the lush garden. Discover the most jaw dropping interiors in this home placed on the National Register of Historic Places. If you appreciate luxury and traditional craftsmanship you'll find it at The Simmons Estate. Authentic architectural design reflects an original commitment to artistry that has stood the test of time and has been meticulously updated to meet modern luxury. Home was designed by acclaimed architects Kiehnel & Elliot, who designed the Coconut Grove Playhouse; the Coral Gables Congregational Church; the Carlyle Hotel in Miami Beach; the downtown Miami Post Office, and the Federal Courthouse amongst other properties. OWNER MOTIVATED, BRING OFFERS ! YOUR CLIENTS WILL LOVE THIS HOUSE IN THE HEART OF MIAMI SHORES ! A RENOVATED MASTERPIECE WITH 4 BD , 5BTHS + A FAMILY ROOM AND A POOL ! THIS 3400 SQFT BEAUTY FEATURES NEW HIGH IMPACT WINDOWS, A GOURMET KITCHEN WITH SAMSUNG BLACK STAINLESS STEEL APPLIANCES, NEW BATHROOMS WITH ISOLE EUROPEAN DESIGN & TEMPERED GLASS SHOWER DOORS, 32x32 POLISHED HIGH GLOSS PORCELAIN TILES IN LIVING AREAS, HIGH END GRAY LAMINATE WOOD FLOORS IN BEDROOMS, TWO NEW A/C UNITS, HUGE MASTER SUITE OVERLOOKING THE POOL WITH LARGE CUSTOM MADE WALKING CLOSET ! NEW ELECTRICAL, ! EACH BEDROOM HAS ITS OWN BATHROOM AND CUSTOM MADE CLOSET ! BEAUTIFUL LAYOUT , LOTS OF LIGHT ! WALKING DISTANCE FROM PROPER SAUSAGE, THE MIAMI SHORES THEATER & FLIGHT WINE BAR ! IDEALLY LOCATED 4/3 POOL HOME ON EXPANSIVE 17,880 SF CORNER LOT STEPS FROM THE BAY IN EAST MIAMI SHORES. HOME FEATURES SPLIT PLAN WITH LARGE BEDROOMS AND OPEN LAYOUT, EAT-IN KITCHEN, WORKING FIREPLACE, SPACIOUS LIVING AND DINING ROOM, & LUSH BACKYARD GREAT FOR ENTERTAINING WITH COVERED TERRACE OVERLOOKING POOL AREA. OVERSIZED LOT ALSO PERFECT FOR BUILDING YOUR DREAM HOME ON ONE OF THE BEST STREETS IN BEAUTIFUL MIAMI SHORES. SF LARGER THAN TAX ROLL AS PER APPRAISAL (2,333 LIVING AREA). CALL LA FOR SHOWING. Step into Cape Cod and never want to leave this lovely home with an amazingly flexible floorplan. House accommodates a large family by leaving many areas where you may find privacy. Living Dining and kitchen with French doors to a wonderful exterior living area. Home theatre and home office. Master has its own wing, 2 bedrooms that share a bath and 4th room with its own bathroom. Kitchen has a huge pantry/hobby room, loaded with storage space. Oversized lot with room for pool, vegetable garden. Enjoy the covered entertainment and outdoor living years. Hardwood floors throughout. Do not miss!! HIGHLY MOTIVATED SELLER! BRING OFFER! PRICED TO SELL!! REMODELED 4 BEDROOM & 2 BATH HOME IN THE HEART OF MIAMI SHORES. WALK INTO THIS OPEN & SPACIOUS HOME WITH TONS OF NATURAL LIGHT. BRAND NEW IMPACT WINDOWS. RENOVATED OPEN KITCHEN WITH STAINLESS STEEL APPLIANCES OVERLOOKING DINING ROOM. MASTER BEDROOM W/WALK-IN CLOSET. PRIVATE AND COZY BACKYARD FOR ENTERTAINING. HOUSE SITUATED ON A CORNER LOT FOR PRIVACY. WALKING DISTANCE TO DOWNTOWN MIAMI SHORES, RESTAURANTS, SHOPS & GYMS. A MUST SEE!! SELLER MOTIVATED! OPPORTUNITY KNOCKS! IRRESISTIBLE PRICE! Spacious & Inviting with brick fireplace 4 Bedrooms 2.5 Baths 1950 sq.ft. Separate Entrance to 4th Bedroom. The living spaces incorporate a large den and extra rooms for laundry & storage. The large yard offers many options for outdoor living & entertainment. Easy maintenance tile floors throughout plus new kitchen & newer windows creates a comfy feel for your family gatherings. New flat roof keep you safe and dry. Split floor plan offers Master Bedroom privacy. Enjoy the Miami Shores village amenities including Country Club, Water Park, Private Tennis Club and Recreation Center. Private Police Force keeps you safe. A tropical Oasis in the heart of Miami. Seller says larger than tax rolls. Seasonal, amazing 3 bedrooms 2 bath home in Miami shores. The kitchen has upgraded stainless steel appliances and stunning quartz counter tops. Beautiful layout with a lot of lighting. Walking distance to downtown miami shores, 15 minutes drive to Miami Design district and wynwood. Completely remodeled Miami Shores home on a large lot. Beautiful 3-bedroom home. Brand new kitchen with quartz counter top and stainless-steel appliances. Modern bathroom. IMPACT WINDOWS. Hardwood floors and tiled. Attached GARAGE. Charming Fireplace. Laundry room with brand new washer and dryer. Large completely fenced yard with brand new deck, perfect for entertaining. Room to park a boat. Minutes to major expressway. A must see! LEASE OPTION TO BUY available!